Sittuyin or Burmese Chess is another ancient chess variant from South East Asia. 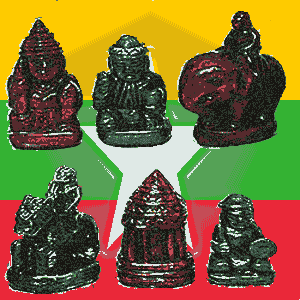 Unlike the modern western variant Martian Chess, Burmese Chess has a history of more than a thousand years. Burmese Chess uses a 64 square, 8x8 game board like our game. Their game board also has two lines running through the long diagonals from corner to corner. These lines are called sit-ke-myin meaning General's Lines. They mark the promotion squares where the pawns are promoted to generals. Western Chess now dominates in Burma as it does in so many countries but the native variant is still strong in certain regions in the North West. The game gets it's name from the Burmese word Sit which means army or war. The game Sittuyin was only learned of by non-Burmese people in the early 19th Century. But it had been part of Burmese culture for over 1,000 years before that. The British ambassador, Major Symes, made the first recorded report by a Westerner around 1800. Doctor Adolf Bastian also made mention of this variant, describing the rules in 1863. It was around this time that Myan-ma Sit Bayin Lan-nyunt Sa-ok Gyi (Burmese Chess Guide) was published. The king (Min-gyi) moves just as the king does in Western Chess. The game ends with his capture as in Western Chess. There is a general (Sit-ke) instead of a queen. The general moves one square diagonally in any direction. Sittuyin has elephants (Sin), not bishops. It has the same movement as a general, one square diagonally in any direction. In addition it can also move one square forward. The horse (Myin) moves just as a Western knight does. That distinctive L-shaped move of two squares straight in any direction followed by the right-angled turn and one square in that direction. Like the Western knight, it can jump over any obstructing piece, friend or foe en route to it's destination. The chariot (Yahhta) moves just as a Western rook does, straight in any direction as far as the way is clear. The feudal lord (Ne) moves and captures like a Western pawn, one square straight ahead and capturing an enemy on an adjacent file, one square ahead diagonally. It does not have the initial two-square move as it starts the game in an advanced position. Both players set up the pawns as in the diagram, first Red then Black. In tournaments a curtain is used so the players can't see where their opponents are placing their pieces. They then take turns to place their pieces in random positions behind the pawns. The back row is reserved for the chariots (rooks) who must be placed there. A chariot cannot be placed on the same file as the enemy king unless there is an enemy piece shielding the king. The king, general, elephants and horses are then placed wherever behind the pawns. A piece can be moved on to a square occupied by one of it's own feudal lords. That feudal lord is then placed on the same file behind the piece that took it's place. When a feudal lord reaches a square on the long diagonal with the diagonal line running through it, it can be promoted to a general. This is only possible if the general has already been captured. The promotion can take place at any time, perhaps several moves later. Promotion is counted as a move. If a feudal lord is moved beyond the promotion square it can never be promoted. There are some resources online if you would like to try your hand at Sittuyin. Sittuyin is a good game. One of the most innovative features is the set up of the pieces. Instead of an opening from a set structure you get to post your officers where you please behind their front line. Instead of opening systems you have opening set ups with perhaps more possibilities. There are certain variations in the rules as you move from region to region. So you may want to check the house rules if you ever visit Burma and find yourself playing a game. We'll be finishing our chess variant world tour with a look at a modern variant of Western Chess. This variant is Hexes Chess.